The Winter 2016 issue of GRADnews has been sent off for printing. It will be distributed to all PGRs and staff across the SEPnet members over the next two weeks. Watch out for it in your mailslots or in your PGR student common rooms/areas. If there’s one in your mailslot, then it’s for you! This issue concentrates on Public Engagement and Outreach: see how your research can be improved and how it can be made relevant by engaging with the public. You’ll read about the Photonics Garden displayed at the Tatton Park show last summer, the Physics and Faith colloquium run by St Mary’s Twickenham, the SEPnet Public Engagement awards and the winning projects and people, and the Astroquizzical Blog run by Dr Jillian Scudder at Sussex. Included in this issue is an insert listing PGR placement and other employer engagement opportunities organised by GRADnet. As always to fully participate in the GRADnet programme you need to be registered on the GRADnet VRE and logon regularly. You can download low quality versions of the newsletter here. A full higher quality version is available to download here. Supersymmetry – theory and phenomenology Lectures at the University of Sussex, on April 12, 2016 – Register Now! We are thankful to SEPnet for sponsoring an afternoon of lectures about Supersymmetry (theory and experiment), at the University of Sussex, on April 12, 2016. This training event takes place the day before the three-day ATLAS SUSY workshop. While the ATLAS workshop is restricted to members of the ATLAS Collaborations only, the lectures are open also to non-ATLAS participants. Attendance by SEPnet students is encouraged particularly. We foresee two lectures, one by Sebastian Jäger (University of Sussex), and one by Tommaso Lari (INFN and University Milano). 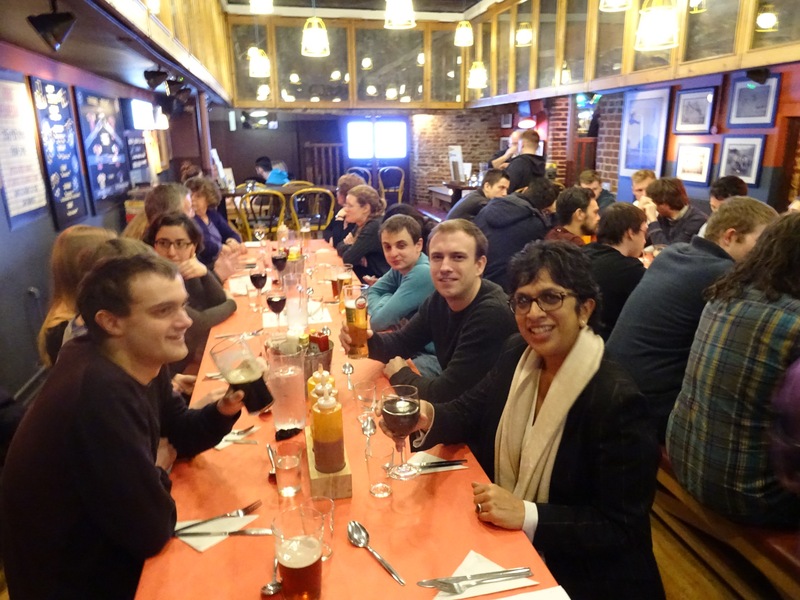 Sebastian is a well-known theorist with a strong track record in heavy-flavour and BSM physics, while Tommaso is an experimentalist and one of the ATLAS SUSY Working Group conveners. The event will start at 13:30 and is expected to last about four hours, including breaks. The level of the lectures will suit early PhD or advanced Master’s students. There is no registration fee for this event. Travel expenses will be covered for students with a SEPnet affiliation. 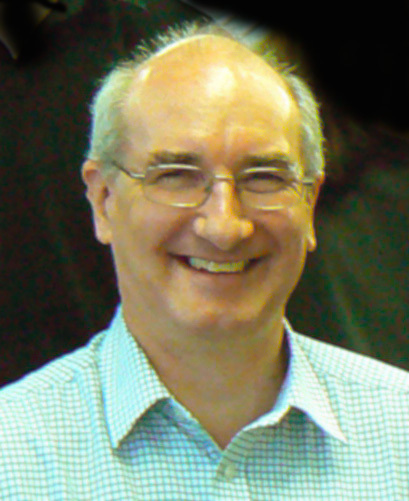 Alan Beesley, Director of Sensors Engineering, Selex Electronic Systems opened the first day with a talk on leadership and management from a personal perspective. In the afternoon Dr Julie Reeves, University of Southampton, presented the Belbin Inventory where delegates looked into their preferred team roles and how they were perceived by others. Laura Herbert and Ben Norton, HR, Thales Group, began the second day with an insight into leadership and team working in industry followed by an assessment centre style challenge which delegates found very useful. One delegate described this task as “awesome”! 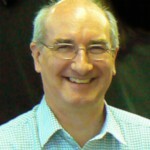 Trevor Long, University of Reading gave a presentation on the nature of leadership and looked at the key attributes of effective leaders. This was followed by an activity looking at the real life multi-media case simulation, exploring a wide range of leadership and team issues during the Columbia Space Shuttle mission. Delegates were immersed in the actual events that unfolded in NASA during the ill-fated mission and experienced the complex interplay of individual, team and cultural dynamics. 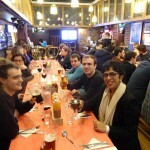 There was time to relax at the Penny Theatre in Canterbury with supper and a physics quiz on Monday evening! The Marshmallow Challenge proved to be entertaining. 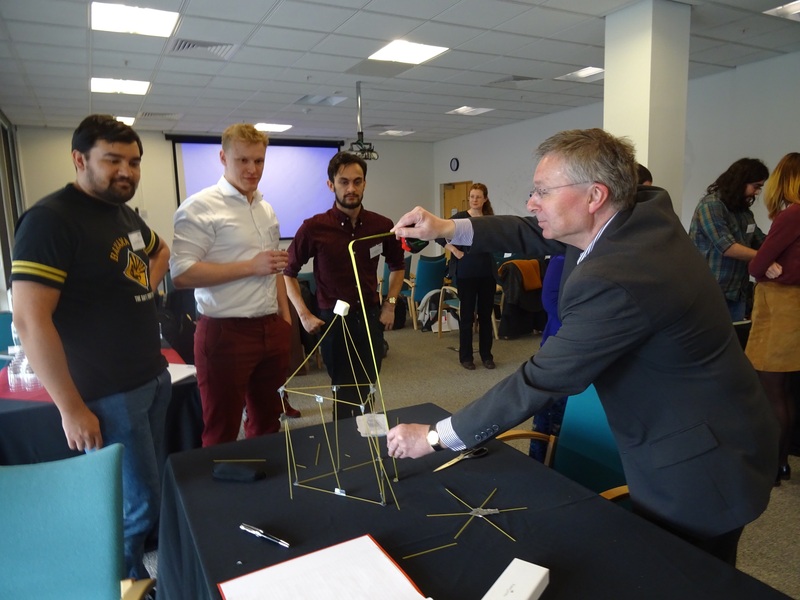 This was a simple team-building exercise where delegates had to build the tallest free-standing structure with 20 sticks of spaghetti, one yard of tape, one yard of string, and one marshmallow in 18 minutes. 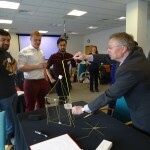 The Marshmallow Challenge is a fun and instructive design exercise that encourages teams to experience simple but profound lessons in collaboration, innovation and creativity. SEPnet organises an annual placement scheme for physics students at SEPnet Partner universities and is seeking 8-week plus projects in industry or research in areas such as data analysis, mathematic modelling, product design and testing or science communication. No two researchers would ever completely agree on the definition of a strongly correlated system; however they may very roughly be described as materials where the correlations between ectrons induced by interactions make the behaviour of the material `interesting’. This interactive two-and-a-half day residential workshop is designed for PhD students who would benefit from learning more about this subject. The course will consist of three short lecture courses of three lectures each, covering both the theoretical concepts necessary to understand strongly correlated systems, as well as how one would probe them experimentally. The course will be self-contained, assuming only a knowledge of quantum mechanics and undergraduate level solid state physics. It should therefore be beneficial to students working on both theoretical and/or experimental projects. Opportunities, CV, Interview 27 May 2016: Friday, 27 May 2016, 0930-1700 at the Royal Astronomical Society, Burlington House, Piccadilly, London W1J 0BQ. 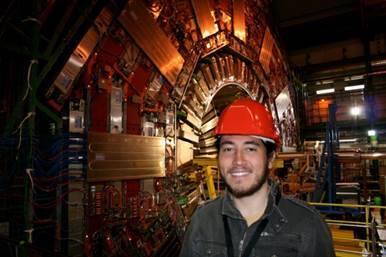 There are a huge number of opportunities out there for those graduating with a Physics PhD; however, finding these opportunities and then applying for them can be daunting. This day is designed for final year doctorates in order to support you in finding and landing a fantastic job after you graduate. In this workshop, we will explore different career choices available and discuss how you know what is ‘right’ for you. We will help you learn to tailor your CV to specific jobs, increasing your chances of getting an interview. In the afternoon, we will hold a CV clinic during which you will receive individual feedback and suggestions on your CV from people who are involved in evaluating CVs professionally. There will also be a panel discussion on interviews, providing you with insight into the interviewer’s point of view and giving you a chance to ask all of your burning questions. This will be an interactive day in which you explore what you want out of your career and how to get there! Find out about work experience and mentoring opportunities; Develop your networking and communication skills. To register for the above events please log onto the VRE. If you do not have a VRE login then you will need to request one at www.sepnet.ac.uk/vre. These events can be found under the Training tab and the Events Catalogue and Registrations page.